How can you tolerate Mia shouting at you for everything? It’s really annoying and drives me up the wall. That noise is driving me up the wall (= making me annoyed ) . My flat-mate is driving me up the wall at the moment. 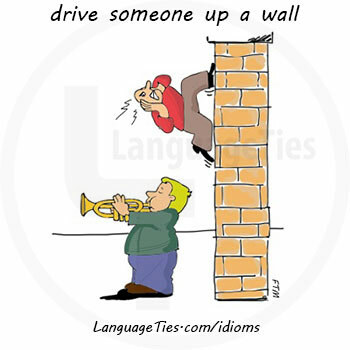 If you say that something or someone is driving you up the wall, you are emphasizing that they annoy and irritate you. The heat is driving me up the wall. I sang in the bath and drove my parents up the wall. : to make (someone) irritated, angry, or crazyYour constant tapping is driving me up the wall!